I was so prepared to enjoy this – I’ve read all her other novels, including the latest one, Epitaph, and I’ve enjoyed them all – until now. Russell’s main claim to fame is her first novel, The Sparrow of 1996 (link to Wiki article) and she’s not achieved those heights since although the writing is equally good – the originality of that marvelous book is missing. (Maybe I would have liked this book better had I not had the expectations of another The Sparrow.) I think all of her awards have been for that book. Margaret MacMillan (2002) and Lawrence in Arabia by Scott Anderson (2013). As a result I’m rather irritated by the historical figures coming to life and having little conversations with our fictional 1st person heroine, Agnes Shanklin. Agnes is the only survivor in her family after the Spanish Flu has exacerbated the death count of WWI and she has inherited a great deal of money. 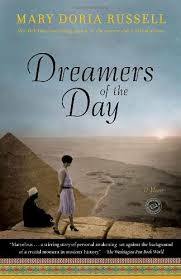 So she, a little old (age 40) maiden school teacher, decides to take a trip to Egypt in memory of her deceased sister and her husband. Of course she brings her little companion doggie, a dachshund named Rosie. 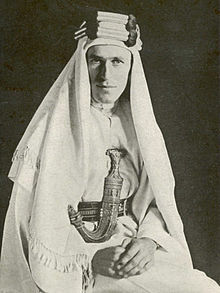 Thanks to a relationship with Agnes’ sister, she meets “Teddy” Lawrence (of Arabia) and then Gertrude Bell, Winston Churchill and falls in love with the fictitious Karl Weilbacher, a German spy. (There were German spies in Egypt at the time, though – and one was a womanizer – Curt Pruefer – see the Anderson book). Karl is Jewish, married, a charmer. Agnes is such a complete naif in Egypt that I could simply not buy into the adventures she, as a tourist, had with her little doggie. Her voice annoyed me in general and the reader’s voice was cloying. Even her little doggie annoyed me. Agnes’ interactions with Churchill, Bell and Lawrence annoyed me. The historical interest of how the Middle East got to be as it is today was pretty interesting, but I knew that already (except for the part played by Gertrude Bell) and I suppose that’s what the novel is meant to teach us.